We don’t have to keep asking “Rosetta are we there yet?” anymore – we’re there! This morning, August 6 2014, Rosetta made its arrival at the ~4-km-wide comet 67P/Churyumov-Gerasimenko, and soon sent back some incredible pictures of its surface taken with its OSIRIS science imager. The one above was acquired at a distance of 130 km (80 miles) and shows some very rugged terrain and large boulders, and but some rather smooth, flat regions too. (The same area had been imaged a few days earlier – see at right – but the closer distance obviously allows for much more detail.) Congratulations to ESA and Rosetta for becoming the first mission to rendezvous with a comet! Now the real science can begin! Here’s an enlarged look at the boulders in the top image. The largest one is about 38 meters across! 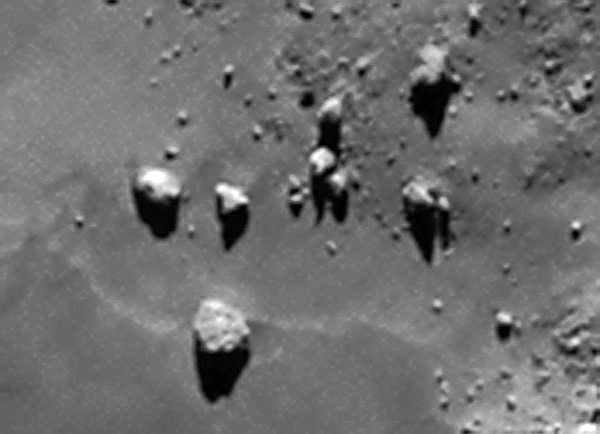 A close-up of boulders on 67P/C-G imaged by OSIRIS from 130 km. The largest one is about 38 meters (125 feet) wide. Credit: ESA/Rosetta/MPS for OSIRIS Team MPS/UPD/LAM/IAA/SSO/INTA/UPM/DASP/IDA. Edited by J. Major. After all this time it’s incredible to be seeing such detail of the surface of a comet, 404.5 million km away. And as Rosetta continues to establish a tighter and tighter orbit around 67P/C-G, eventually coming within 30 km (18 miles) of it, the images and data are only going to get better. The image below, showing the bright “neck” of the comet, was taken with OSIRIS from even closer – about 120 km (75 miles). That’s some crazy terrain, probably not a good place for Philae to land! “Over the next few months, in addition to characterising the comet nucleus and setting the bar for the rest of the mission, we will begin final preparations for another space history first: landing on a comet,” said Matt Taylor, ESA’s Rosetta project scientist. Learn more about Rosetta’s next steps here. 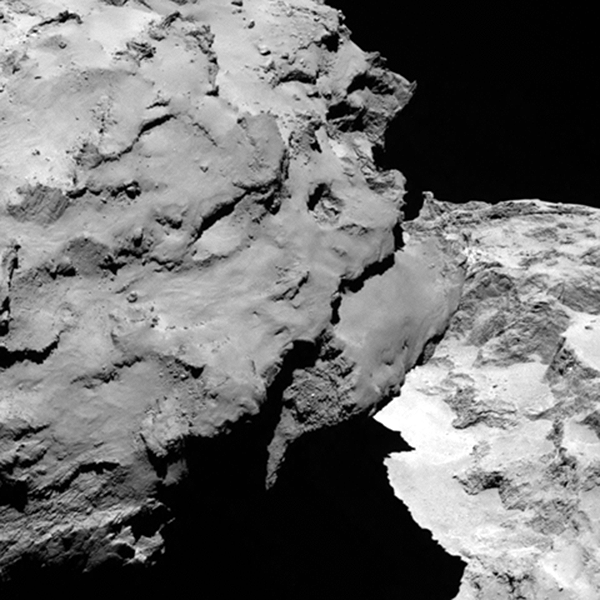 Follow along with the Rosetta mission here. Previous Post Get Ready for Rosetta’s Rendezvous with a Comet! Bravo to Rosetta and to the engineers of the ESA who allowed this success : send into orbit around a comet.